Sweet apples and tart cranberries collide to make these delicious Apple Cranberry Tarts. This is the perfect recipe for your fall celebration. Once fall rolls around here in the great state of New Jersey, there are a few things that I look forward to. Pumpkin and apple season on our farm is definitely my favorite time of year. Another thing I love about fall in New Jersey is the local cranberry harvest. Just 12 short miles from our farm, nestled in the Pine Barrens of Chatsworth, are some of the largest, oldest and most prolific cranberry bogs in the United States. Yes, it’s cranberry heaven. The cranberry harvest is in full swing and these Apple Cranberry Tarts are the perfect way to enjoy their bounty. 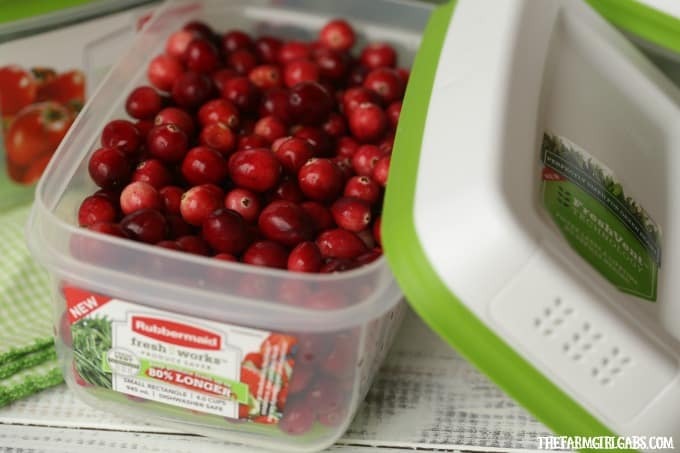 Cranberries will keep in the refrigerator for at least one month and sometimes longer. I like to use Rubbermaid® FreshWorksTM containers to store my fruits and vegetables. Cranberries store perfectly in them. FreshWorks is a food storage container that uses patented FreshVent technology to keep produce fresher up to 80% longer* than traditional produce packaging. It uses a revolutionary built-in FreshVent lid, which naturally regulates the flow of oxygen and CO2, in and out of the container to create the optimal environment so produce stays nearly as fresh as the day it was picked. The CrispTray at the bottom elevates produce away from moisture and promotes proper airflow to help reduce spoilage. Be sure to enter the giveaway below to win a set of your own. Sweet apples and tart cranberries are the perfect duo. I picked these apples just for this recipe. These Apple Cranberry Tarts are really simple to make. You can easily make them and serve as a Thanksgiving or Christmas dessert. I took a shortcut in making these tarts by using store bought pie crust. Measure the size of your tart dish and cut out a circle a little larger so you can fold over the apples. They have a rustic look so no need to worry about perfecting the perfect crust. Bake these Apple Cranberry Tarts until golden brown. This recipe has the perfect blend of sweetness mixed in with the tart cranberries. I like to serve them with a nice scoop of vanilla ice cream. In a medium bowl, add sliced apples, cranberries, sugars, cinnamon, cornstarch, vanilla, salt and lemon juice. Mix together and set aside. Unroll pie crust and measure each tart dish. Cut out a circle one-half inch larger than the dish. Center pie crust in each tart dish. Add apple-cranberry mixture and fold over the crust. Brush crust with egg wash. I like to make navy bean soup in the fall! Pumpkin spice cookies are a fall fave. Cookies and brownies with my children. Apple bread and cake is my favorite fall recipe. Pumpkin cookies is definitely a favorite!!! Apple pie is my favorite recipe. Pumpkin cupcakes with cream cheese frosting!! I like 5 alarm chili! Keeps you warm and also great for football game gatherings! I love apple crisp, or anything apple. My favorite fall recipe is Pumpkin Whoopie pies with maple cream filling. I love my Sweet Potato Pie that I make this time of year! Our favorite fall recipe is beef stew in the slow cooker. My favorite is pumpkin pie or anything pumpkin, actually! My favorite recipe is my pot roast.